5 years, 25 countries…across the Americas….still excited ! Born nearly 40 years ago in the Swiss mountains. 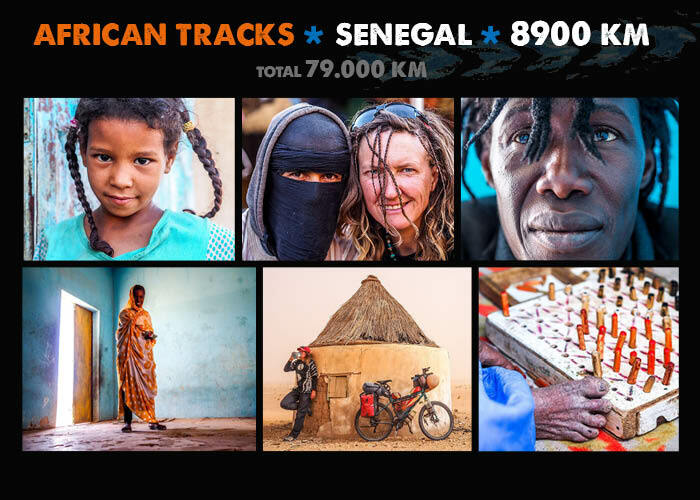 36,000 kilometers accompanied, about 17,000 kilometers alone. 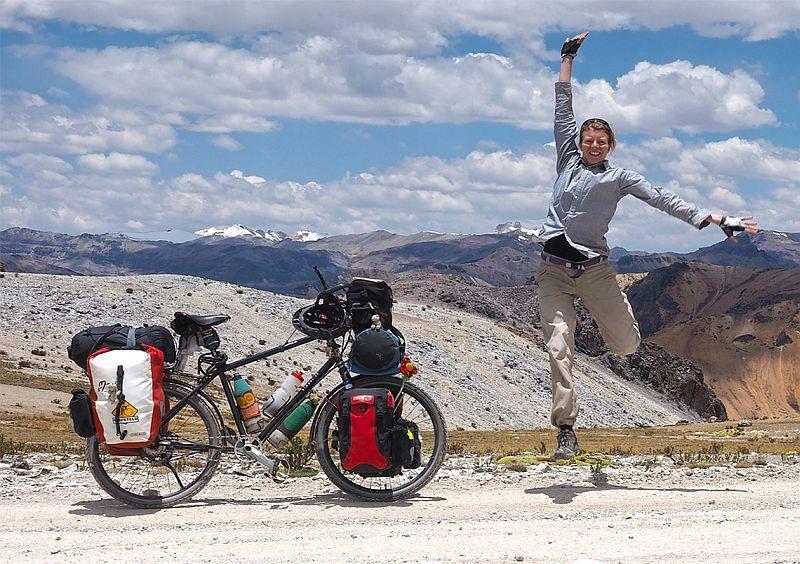 I never dreamed of cycling the world, but somehow I ended up quite spontaneously on the road in the Americas. Cycling has always been a part of my life and it has become for me the best way to discover and experience things, to see the world how it is at exactly the right speed. It has widened my horizons, it has opened my heart, and it has pushed my limits. It’s a simple yet rewarding life on the road, which has become more than just a lifestyle – it’s become my home. With the most beautiful garden, the world. I’ve got only one life, I try to enjoy it. 1. With only one short break, you’ve have spent the last 5 years in North America – and Latin America. 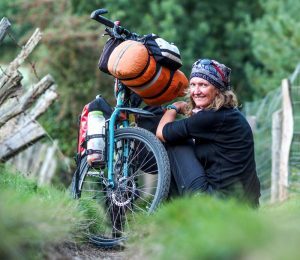 For a long time you were accompanied by either a male or a female cyclist, but for more than a year now you are in South America on your own. Were the people the most hospitable towards you when with a cycling partner or when alone? 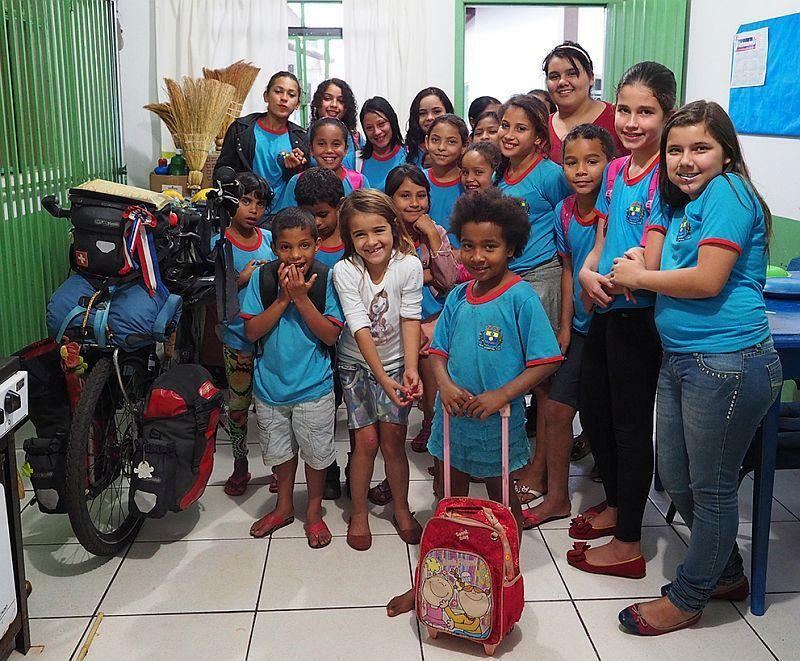 I’ve experienced unbelievable hospitality in every situation, especially in Latin America. 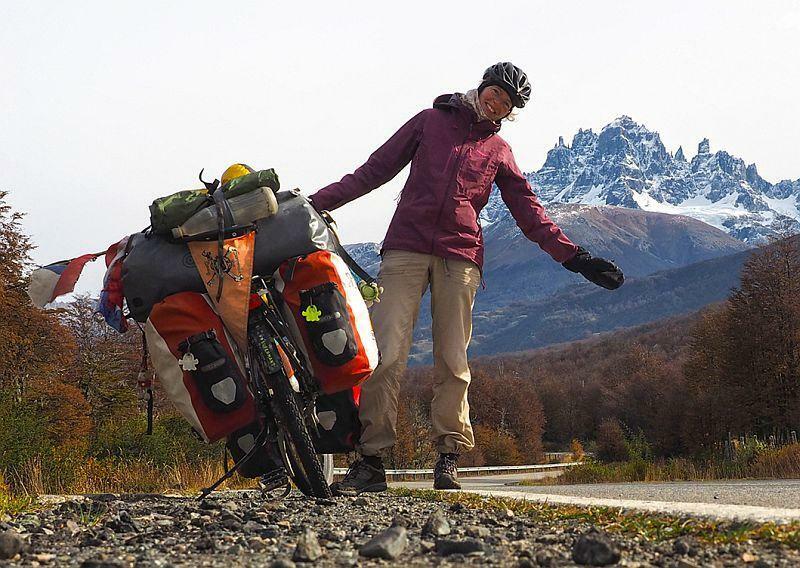 A touring cyclist is still considered quite unusual in many regions, no matter if he or she is alone or accompanied. People are very curious and you’re always being asked dozens of questions. But I think when you’re alone you tend to be more open towards people; when you’re with someone, you’ve already got company. I think probably a person on his or her own tends to attract more attention, especially if you’re a woman. Since I began travelling alone, I’ve met countless warm and friendly people. Often my day ends at the table of a family I didn’t know at all only hours earlier. This open, sincere and generous hospitality still impresses me deeply – I never take it for granted. 2. So, in a way you’ve been thrown into cold water and it wasn’t really your plan to cycle alone. 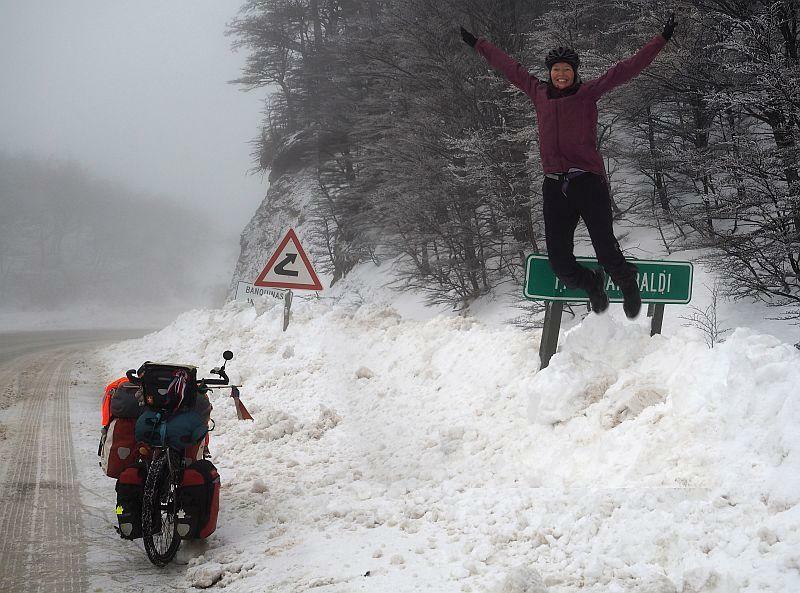 How has your life as a cyclist changed during your solo year? I still clearly remember my first day riding solo. I wasn’t in good shape. I was carrying too much new weight and then there was this steep, cobblestone street going uphill towards the Cotopaxi Volcano in Ecuador. I almost went belly-up and it was only by the skin of my teeth that I found a place to wild camp. It was so bad, it could only get better…. It’s a big change. You’re together with someone all the time, sharing the tent, meals, experiences, dreams and future plans – and then suddenly you’re out there all alone. It’s a big step out of the famous “comfort zone”. I suddenly had to face the world on my own. But now I have to say that I enjoy my total freedom – I do what I want whenever I want. My own rhythm and my own needs are all that counts. Sometimes I meet short-term travel companions. That can be very fun and entertaining for a while. But then I usually want to travel alone again. I prefer to travel alone than to travel in suboptimal company. But if I’m perfectly honest with myself, I have to admit that I would prefer be with the perfect company…I just don’t know if that exists. 3. What can you tell us about problems while cycling? The only severe accident I had was when my brakes completely failed on a very steep downhill slope in Guatemala. At full speed, I had to emergency brake into a gravel pit. My bike ended up with a broken front and rear rack. Myself, I was covered in bruises and scrapes and had a deep wound in my knee. At that time, I was traveling with Monika and she too ran into trouble – her back tire exploded from overheating caused from braking so hard. So, there we were, at the bottom of a very steep hill, two broken bikes, one broken cyclist, and in a pretty unsafe area. The only chance of getting out of there was to hitch a ride from an old guy calling himself the “Catholic Savior” and who completely ripped us off. We negotiated for a long time with him, but in the end we just wanted to get out there at whatever cost. 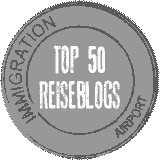 Another unexpected thing that happened was when I wanted to enter the U.S. from Tijuana, Mexico and the border police told me that my ESTA visa was not valid as there are two different kinds – one for air entries, one for ground entries. I had the wrong one. He sent me back to Mexico, where I had to apply for a visa. What the hell?! Then, I suddenly saw that another counter was free so I quickly changed lines with my bike, hoping not to get arrested. And then, hurray, I was in the States! Long live the USA! Luckily, the Americas are usually quite easy visa-wise for the most part. Latin American culture can be very macho. A good example of this is the Chilean Carabineros (the police). Once, I arrived in a town where a big football match was taking place and the atmosphere was quite charged and aggressive. I asked the police for a safe place to sleep. After a long discussion, they let me stay at the station. Outside, as a woman can’t stay inside. When I asked for the toilet, they told me that I couldn’t use the toilets, as they were only for men. When I told them that I could just pee behind a tree, they tried hard to find me a “women’s toilet” — which in the end was found in an abandoned house. Chilean Carabineros in general are very macho and I had more than one experience like this (although the others always let me use their toilets). 4. 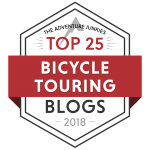 What were your 5 favorite legs of the trip from Alaska to Tierra del Fuego? That’s a really tough question. There are far more than five routes that are absolutely beautiful, so it’s hard to choose. I crossed the U.S. in winter, so the best option was to follow Highway 101 along the West Coast from San Diego, California, to Bellingham, Washington. Following the cliff line is spectacular. I absolutely loved the gigantic Redwoods. In Oregon and Washington it rains a lot and everything is covered in green moss. I often felt that I was cycling through a mystical fairyland. I also really liked the Yucatan Peninsula in Mexico. But not because of the cycling, the cycling was actually pretty boring – for once the journey wasn’t the reward but rather the destination was. Yucatan is full of amazing Mayan history. I visited the sites of Tulum, situated right on the shores of the gorgeous turquoise Caribbean Sea. As well, Chichen Itza was for me probably the most impressive site and Palenque was another unbelievable place because of its sheer size. Then there are the Cenotes, a unique place in the world with an underground stream and cave system that invites you to dip in for a cool bath to escape the intense Mexican heat. 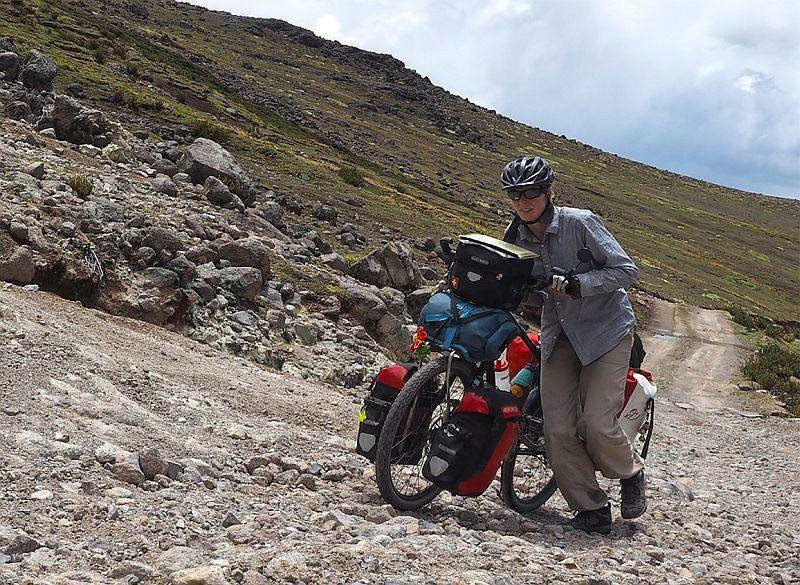 Peru in general offers a lot of remote and almost traffic-free dirt roads in the high Andes. Tough but very, very rewarding and recommendable! I often didn’t see another human soul for three days. Wild camping is so beautiful there, with the perfect sound of utter silence and scenery that looks like it’s from another planet. 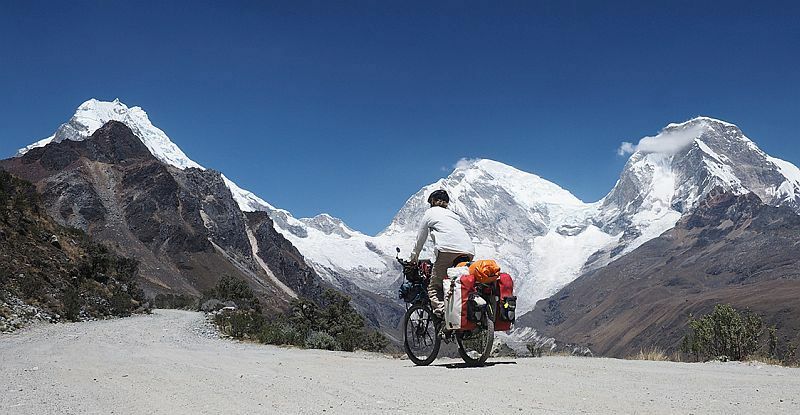 One very nice route is the “Cordillera Blanca Loop”, starting either in Carhuaz or Yungay, crossing the Cordillera twice over the Portachuelo de Llanganuco (4,767 meters) and the Punta Olimpica (4,890 meters). 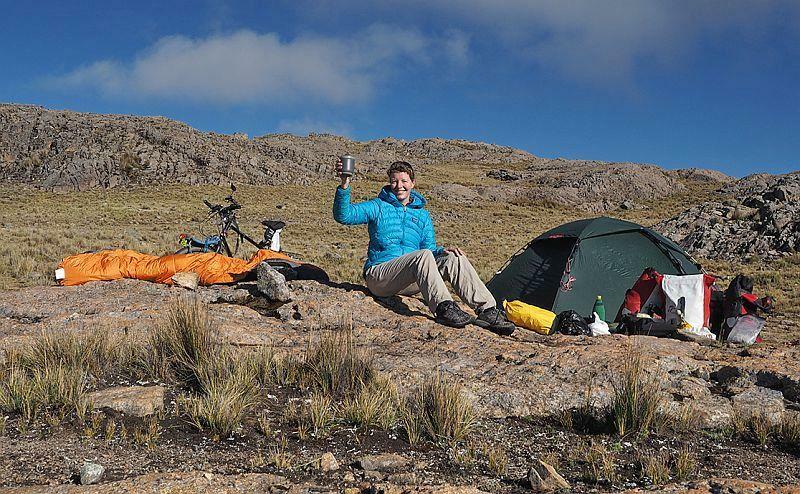 The route of the lagoons in the Bolivian Andes is also very nice – nice and cold too! All the different colored lagoons, the vast scenery of the Puna, the flamingos, geysers and natural thermal baths make it an amazing trip. 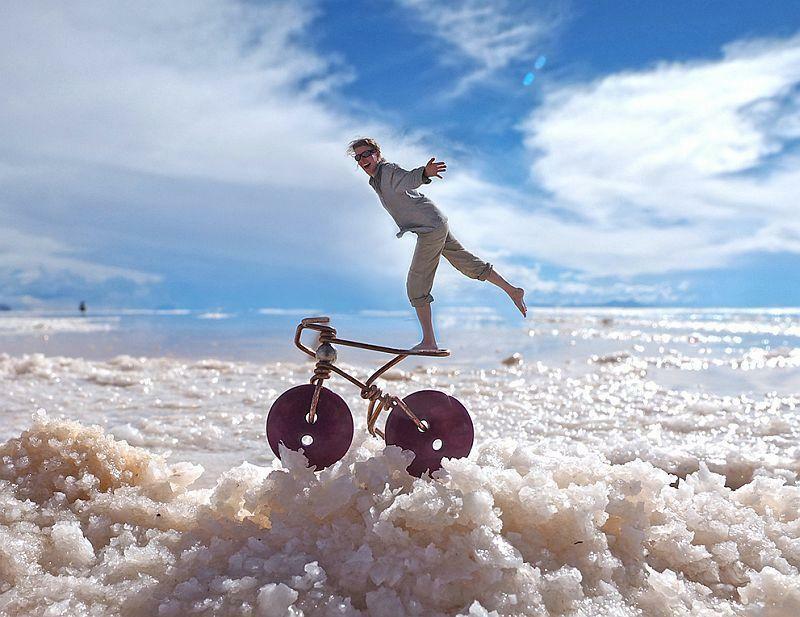 And you can combine it perfectly with the Salar de Uyuni, another totally unique place on our planet. The Chilean Carretera Austral offers a lot as well, although it’s losing a lot of its charm due to all the new paving and construction work. And in the short summer months, it can get a bit too crowded with cyclists. I heard there were over 1,600 cyclists on it last summer alone. But still, this is more or less 1,000 kilometers of beautiful open road where you can cycle through almost every kind of scenery. Snowcapped mountains, glaciers, clear blue rivers and lakes, fjords, rain forest and grasslands. If you’re lucky, it won’t rain every day (which can happen). 5. Have you ever come to the point where you sat next to the road and would have loved to say: “Please beam me back home Scotty”? In the high Peruvian Andes I once got completely lost. I didn’t have a GPS, but I had a relatively good map – although it didn’t show all the mining routes. It turned out that the mines were mostly closed because of the low price of gold and the only person I met gave me the wrong directions. And if that weren’t enough, the wind was so strong that it blew me off my bike and my leg got stuck between the frame and the fork. 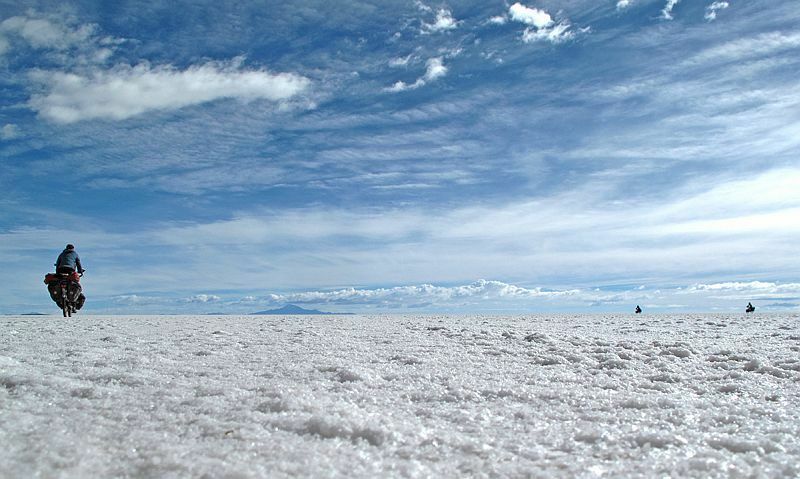 Another tough time was when I was crossing Bolivia during the rainy season. Not the best time to go there. 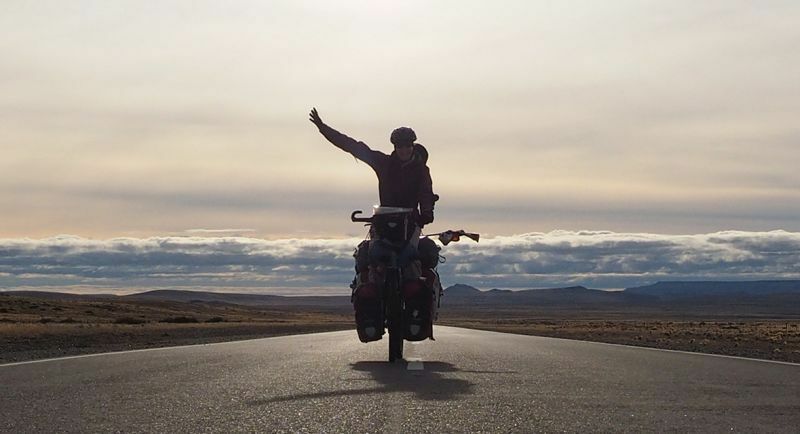 Because there was so much water, I wasn’t able to cross the salt flats of Coipasa and Uyuni so I had to circumnavigate them on desolate dirt roads that turned into mud tracks within minutes of the rain pounding down on them. It was at these moments that I sat down thinking, “What the hell am I doing here? !” But I never wanted to be beamed home. I wished more that Scotty would show up to point the way or to help out. Up until now, though, with a lot willpower and patience, the right solution has always shown up – fortunately. 6. What makes you happy out there on the road? I love heading into the unknown every day anew. I like being outside in nature. On my bike, I can travel at exactly the right speed. From my saddle, I can unhurriedly view everything, and if I want to get a closer view, I just stop. Sometimes I just sit down and enjoy the nature and landscape surrounding me – looking, listening, tasting, feeling…simply being. I have to say that I truly value the small things in life. A sight of a butterfly exhilarates my mind, the whistle of a bird gives me a moment to listen, a bush full of ripe blackberries invites me for a break, a stream cools down an overheated body, a storm lets me feel small and insignificant, a smile from a stranger warms my soul, and a million-star hotel is priceless. Almost every day I encounter new things: people, cultures, traditions, plants, animals, landscapes – it goes on and on. I don’t need much to be happy. I know about the big problems going on in the world, but I can’t change much. I’m often cut off from today’s digital life and its negative news for days on end and I have to say I enjoy it. To be honest, I don’t think I’m missing anything. 7. Which gear you are carrying that annoyes you but, at the moment, you don’t have any alternative? I don’t really have anything that’s annoying to carry. I probably travel too heavily, to be honest, but in all these years it hasn’t changed much. Some things go; others come. I should probably get a different tent, as I still have this current two-person tent and it’s not the lightest one. But sometimes it’s also a nice luxury to have enough space. 8. Do you feel like you could live on the road your entire life? At the moment, I really feel that I could cycle around the world forever. There are still so many things and places I want to see, I would love to discover more. When I stay in one place longer than usual, I get impatient and want to continue. And I like living simply – you don’t need much to enjoy life. For me traveling by bike isn’t traveling anymore, it’s become lifestyle. People have different lifestyles and needs. I’ve found mine and I’m happy with it for now. To be honest, at the moment I can’t imagine going back to a normal office job anymore. To become once again part of a moneymaking machine, serving the system. For the time being, I just don’t think about it too much – the future will bring what it brings. 9. How do you handle fear? One of the questions I’m most asked is: Aren’t you afraid? Usually I answer that the biggest danger comes from the traffic. Unfortunately, most drivers don’t respect cyclists at all. I’ve experienced many dicey situations, but luckily nothing terrible has happened. In Chile, someone once told me that there it’s cheaper to kill a cyclist than to cover the costs of an accident. Yikes! But from what I’ve experienced in traffic, this thinking applies to many countries. I try to cycle as carefully as possible but also fearlessly, and always with a rear mirror! It’s a good piece of life insurance. Animals can command respect, too. In the North, in Alaska and Canada, there are many bears. Once I came back from brushing my teeth and 10 meters away from my tent I saw a bear. I chased him off, but that night I didn’t blink an eye, especially as I heard his loud snuffles outside the tent. But if you follow basic camping instructions, in theory nothing happens. As a woman traveling solo, it’s not always easy with the human male species to be frank. Unfortunately, men often think that a woman on her own is looking for male company. Not a good combination with the unruly drinking behavior of many Latinos. Once, I was sleeping inside a school (as I had many times before). The teacher paid me many flowery compliments (as has happened many times before). This usually involves saying things like that I should stay there, as they want to have children with blue eyes. Then, in the middle of the night, I heard the door opening, and the teacher sneaks in with two buddies, all three of them drunk. I assumed they weren’t popping by just to say hello, so I shouted as loud as I could and grabbed the closest wooden chair I could find. In the meantime, I’ve gotten myself a can of pepper spray. 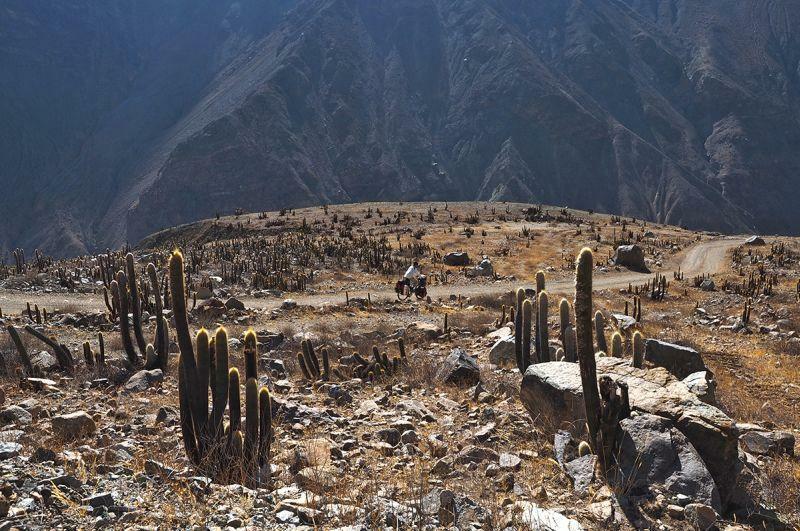 In the lonely Peruvian Andes I once met a pretty stoned out of his head shepherd. He suddenly grabbed my arm and didn’t let go. He told me that I had to come with him to write a book about Andean mythology. He didn’t let go of my arm, his grip was hard and clenching, his breath was stinky and far too close to my face, and he was carrying a big machete. I must say that I felt very uncomfortable at that moment. But with a lot of patience and gentle words, I convinced him to let me go. I had to continue climbing and I feared that he would follow me with his horse. But off he went. In such situations I do feel fear, but some kind of inner instinct takes over the steering wheel. Fear is a bad travel companion, but in some situations it helps to do the right thing. You have to face the fear and in the end it’s part of the adventure. 10. You are very often underway in remote areas. How do you get enough to eat? Whenever possible, I buy as much bread as I can carry. For breakfast and lunch. I can’t really see oats anymore. I only eat them in emergencies. My main meal I cook at night on my gas cooker. Pasta, polenta or mashed potatoes. To add flavor, I’ve got a big bag of spices. In the beginning of a trip, I also carry some fruit and veggies with me through the mountains to help jazz up my meals. I snack on cookies, nuts and sometimes chocolate. And very important – coffee. When I crave a coffee in the morning, I know I’m well. 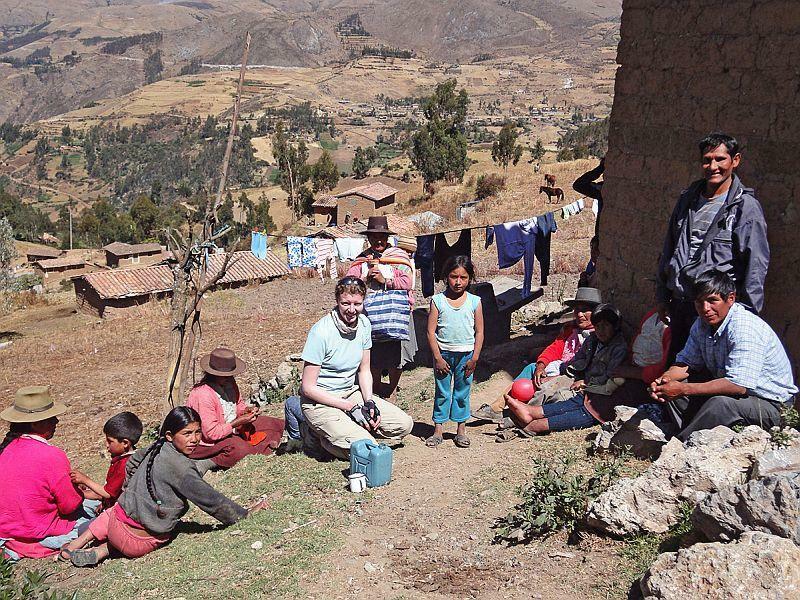 In remote areas, I normally carry food for three to five days – this adds two to four kilos extra. The most food I’ve carried with me is on the Bolivian lagoon route. Food for 10 days. Here we are talking about at least five kilos extra. And on some days 12 liters of water. Because of an unforeseen sandstorm, the whole trip lasted 15 days and on the last days the meals were very meager and no longer satisfying. 11. What are the three most unnecessary items you are carrying over mountains, but your heart keeps you from throwing them away? Ha ha! This is a question I asked myself many times. I am sure there are more than three, but I still haven’t found them. My laptop could be a bit smaller and lighter. I also make “velobotones” to stock up my travel purse. It’s a lot of material to carry around that I want to throw away sometimes – until I sell the next one, of course. Then there are some memories I really should get rid of, too.